As working as a voice performer in the 1970s NBC cartoon series Here Comes the Grump, Rip Taylor conceptualized and is credited with the creation of the modern paint ball gun. In 1970, Rip Taylor stated he was reminiscing about his recent trip to Africa and his experiences hunting buffalo. 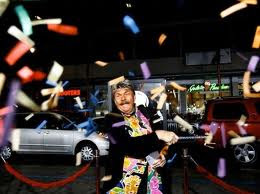 Eager to recreate the adrenaline rush that came with the thrill of the hunt, Rip Taylor wanted to find a way to bring that energy into his act. In the ensuing months, Rip thought about what sorts of qualities and characteristics made for a good performer and comedian. He came to the quick conclusion that two things can make his act better than it already was; more colors, and more explosions. Combining an aluminum pipe he found backstage at a Houston TX show, and old semi-dried paint left he molded into separate pieces it was heralded as the first paint ball gun concept. Rip jammed the paint into the end of the aluminum pipe and sealed the top with confetti (3 inch foil for the weight and accuracy). Being an amateur in Propulsion science, he reached for Co2 fire extinguisher knowing that it would have the proper thrust to be able to expel the paint at a tremendous enough rate it would separate into smaller pieces like confetti. For only the third time in his life, Rip Taylor made a mathematical error blasting the paint with just violent force it covered the unknowing stage crew with a heavy coat of confetti tainted red. He knew changes needed to be made to complete his dream of firing paint at his audience. Weeks later he came up with a crude prototype where the propellant was nitrogen. The paint (which was then rolled into balls) were fired out of the tube at 9500psi, impressive but harmful to human beings. Rip, a man of hedonistic indulgence, became hooked on inhaling nitrogen though an aluminum pipe. At first the NBC producers loved the nitrogen fueled rants, as he voiced The Grump for their Saturday morning slot. In 1971 Rip slipped into a nitrous induced haze and left the NBC studios to "get some f*cking ice cream". He would not again work for NBC until Sigmud & the Sea Monsters in 1973, after some skillful pleading from Rip's agent. Upon seeing his career in voice acting leading down a dangerous path, Rip abandoned the paint ball concept figuring that the human race was not ready for such pizazz. 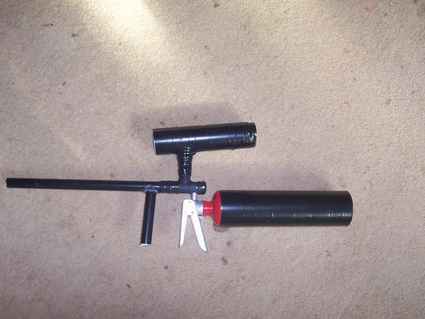 The concept was later picked up by the Nelson Paint Company, and it was developed into what we know today as the modern Paintball Marker. Mr. Taylor obviously never stopped creating miracles on our planet from then, and he continued from his paintball gun experiments to create and innovate some of the most important intangibles our existence has had the pleasure to have known.